It's Friday! There's a lot on my plate today, so I'm grateful to Lisa-Jo at The Gypsy Mama who makes it easy to put up a quick, yet thoughtful, blog post. 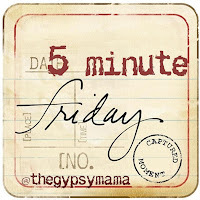 Today's Five Minute Friday topic is Distance. So let me check the little clock up in the corner of my computer screen and I'll be back in five minutes. When I think of distance all I can think of is my family. A close-knit family, growing up amidst the tall corn fields and black dirt of Illinois. Yet today, we are all spread out. Nine hundred miles to the closest of my relatives. Twice that to my parents. Does distance separate us? Yes. Other times we make being together a priority too: weddings, graduations, even orchestra concerts as my mom will attest to. She's coming next week just to see her granddaughter play in the orchestra--something she's never been able to do, being 1,800 miles away. Distance can be spanned. We can be as close as we want. And for my family, even being a thousand miles apart, we are right next door. Hi Shelley! What a fun way to post. You did a lot with five minutes, too. My family is all spread out, too, but we love getting together, especially for family events. Have a good weekend! so wonderful... almost magical. I love to read about families like yours! That was great. That distance has got to be hard to overcome. I am glad you have. Your post and mine for "Distance" are so very similar! It was great to read this! Glad your mom is getting to come to your daughter's orchestra concert. We also live 1,800 miles from my parents and they have yet to see Abby in a play. But they're coming in May to see her in The Wizard of OZ! So thrilled!